The days of swiping your credit card at the cash register are numbered, as a new nationwide plan to protect your private data from hackers starts to go into effect in Southern California. Credit card companies have begun sending customers new microchip-embedded cards. The program is being launched in response to last year's massive credit card breaches at major retailers including Target and Home Depot. Like the magnetic strip on the back of your old credit card, the chip encodes the user's personal information, but the chips are much tougher for criminals to copy or duplicate in order to create counterfeit cards. To accommodate the change, stores are required to buy and install new chip card readers by October 2015. If business owners fail to comply, they'll be on the hook for any costs associated with credit card fraud. Until now, banks have beared that financial burden. Baller Hardware in Silver Lake is one of the first Los Angeles area retailers to already have the new card readers in place. 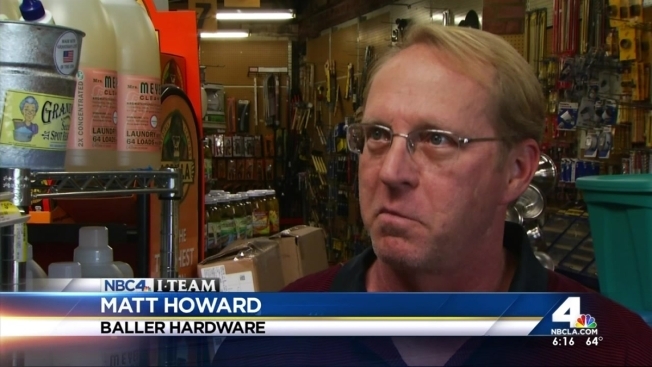 Employee Matt Howard says the transition hasn't been easy for some customers. "At first, they're a little skeptical. Like they say, 'What are you doing with my card? How come it's sitting inside the machine?'" Howard said. "And it does take a little bit longer to process, and I let them know that. That extra 10 seconds that it may take is for their benefit, because it's the safest way of having the card processed." But some consumer advocates complain that the new cards don't do as much to protect private information as the chip and PIN cards widely used in Europe and elsewhere around the globe. "My debit card has a PIN attached to it, but the credit card does not have a PIN attached to it," said Allison Maxwell. "Therefore, to me, it negates some of the effectiveness of the security." But even without a PIN code, the chip cards still give you more personal protection than the ones with just the old-school magnetic strip. That strip can still be found on your new chip cards, so you'll be able to use it even if the store you're shopping in hasn't updated its equipment. But once retailers have upgraded to the new technology, you'll definitely want to skip the swiping, and use the chip when you buy.